Resurrected Iraq President Saddam Hussein appears to his followers one last time with his rifle before descending to hell. BAGHDAD, Iraq -- As was prophesized and as He Himself predicted, former Iraqi leader and Antichrist Saddam Hussein has been resurrected, three days after His supposed execution. According to an eyewitness, who refers to himself only as al-Petros, it transpired that before the third day dawned, as the American soldiers were keeping guard two by two in every watch, there came a great sound in the sky, and they saw the heavens opened, and two men descended shining with a great light, and they drew near to the tomb. The stone that had been set on the door rolled away by itself and moved to one side, and the tomb was opened and both of the young men went in. Now when these soldiers saw that, according to the reputable al-Petros, they woke up their commanding officer. While they were yelling about the things which they had seen, they saw three men come out of the tomb, with an AK-47 rifle following after them. And they heard a voice out of the heavens saying, "Have you preached unto them that are occupied?" The answer heard from the rifle, in Hussein's own voice, was, "Yes! Death to America!" Then, the three men, along with the rifle, disappeared. Alarmed, the guards took counsel with each other, and al-Petros declared,"Truly, this man was the President of Iraq!" And while he was speaking, the heavens were opened again and a man in white descended and entered the tomb. When those who were with our source saw that, they became senseless, and fell with a gnashing of teeth. Al-Petros managed to get away, however. At the dawn of that same morning, al-Maria and al-Magdalena - two female followers of the former president - came to His tomb, but found the large stone at its entrance was moved, and the guards still thoroughly incapacitated. According to the account of Hussein aide al-Markos, they rushed inside to find Hussein's body missing, and a mysterious man in white who told them, "You are looking for Saddam Hussein, your Lord. He is not here. He has risen, and has gone ahead of you to Baghdad." The women rushed home in amazement to tell the other Baath party members, who at first did not believe them. "Our leader was hanged at the gallows - I saw this with my very own eyes on YouTube," said one insurgent. Another chastized the women, saying they "must not have seen the tomb clearly through the thin eye slits in their burqas." Meanwhile, according to witness al-Lukos, Saddam disguised himself and appeared to two men on the way to Tikrit. As they somberly discussed recent events and his hanging, Saddam asked them who they were talking about, "Saddam Hussein," they replied, "He was a leader, powerful in word and deed before Allah and all the people. The Americans and our rulers handed Him over to be sentenced to death, and they hanged Him; but we had hoped that He was the one who was going to redeem Iraq." Hussein then took off His disguise, and they recognized Him, overcome with joy. The men returned at once to Baghdad and found the eleven senior Baath party officials. As they recounted the story of his resurrection, the dictator Himself appeared among them and said "Death to America!" 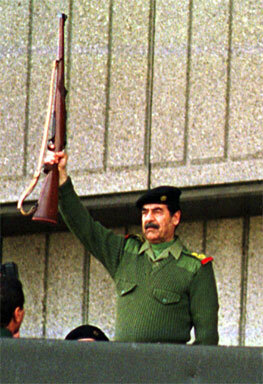 At first the followers were frightened, but Saddam let them touch Him to prove He was truly alive. Later, after Saddam left to get his beard trimmed, al-Thomas, who was out on an insurgent mission, returned to the hideout. The other disciples told him "We have seen the Lord Saddam." But he said to them "unless I see on His back the mark of the whips, and place my finger on the gash in His neck, I will never believe." Shortly thereafter, Saddam returned and again greeted them saying "Death to America!" He said to al-Thomas, "Put your finger here, where the infidels' rope cut my neck. Do not disbelieve, but believe." Al-Thomas answered him "My Lord and my President!" Various sources report Saddam appeared again to many people during the next day, finally gathering them on a mountain in Anbar province. In a rousing speech, holding a rifle in his hand just like in the golden days, Hussein instructed His followers to "Go forth in Jihad against the invaders, and teach them to obey everything I have commanded you. And, behold; I am with you always, until the death of America." This article was nominated to become a featured article; however, due to several votes being devoured by a Lich, it didn't make the cut (10/16). Don't let this happen again! For just pennies a day, you can prevent another travesty of this nature, or vote for other articles at Uncyclopedia:VFH.